The non-skin ZLX ink series is Zipset’s latest four color process inks specifically formulated to offer increased value and profitability in today's competitive marketplace. ZLX unique vegetable oil vehicles allow the ink to stay open on press for up to 4 days! ZLX offers fast drying efficiency coupled with excellent rub resistance increasing productivity and post print finishing. Additionally, ZLX newer binder technology optimizes ink and water balance, increasing ink stability and print efficiency on press. 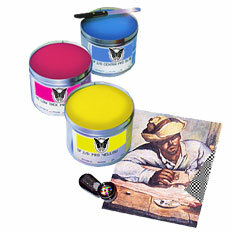 ZLX provides outstanding ink transfer, superior release and high-gloss retention on a large variety of substrates. If you’re seeking greater performance, increased print sharpness and higher productivity, look no further than Zipset's ZLX process ink series.